As the saying goes: in OTT, there is no success without viewer satisfaction. Put simply, if you’re looking for a prosperous and sustainable future in the this space, customer care should be at the top of your priority list. From years of hands-on experience, we’ve discovered that flawless customer service fosters trust, loyalty and brand advocacy. And it’s these elements that ultimately serve to reduce customer churn and, in many cases, encourage consumers to make extra purchases including subscription upgrades, increasing their individual value significantly. 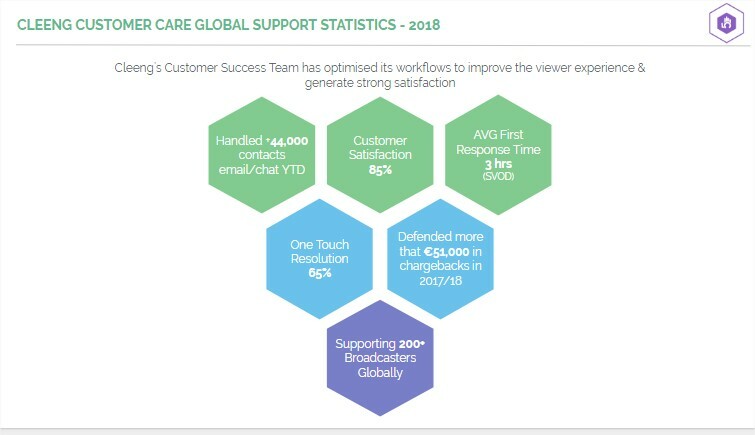 Customer service is the cornerstone of over-the-top success, and with this notion firmly implanted in our collective mind, we set out on a mission to find a robust solution for increased consumer care and user experience (UX) for those operating in the OTT industry. 69% of today’s consumers feel that excellent customer service relates to swift problem resolution. Social media has amplified the need for flawless customer experience because its possible to share any complaints, issues or discrepancies with their peers in the public domain. As today’s viewers value the opinion of their peers above all else, if you provide a level of customer excellence that surpasses that of your competitors, you stand to grow your subscriber base rapidly. Yes, word of mouth is a powerful thing, indeed. Customer care is the future of OTT and if you buy in now, you will reap a raft of endless rewards tomorrow. At Cleeng we know first-hand that customer expectations are never static and to meet the demands of these ever growing expectations we must work in a distinctly proactive and innovative way. With that said, it is essential when launching your OTT service that you have strong self-help materials to encourage customer retention and avoid churn. Having a Help Centre embedded on your site in today’s market is an absolute necessity. “90% of consumers expect a brand or organisation to offer self-service customer support; 60% of consumers have a more favorable view of the brand if self-service is mobile-responsive. 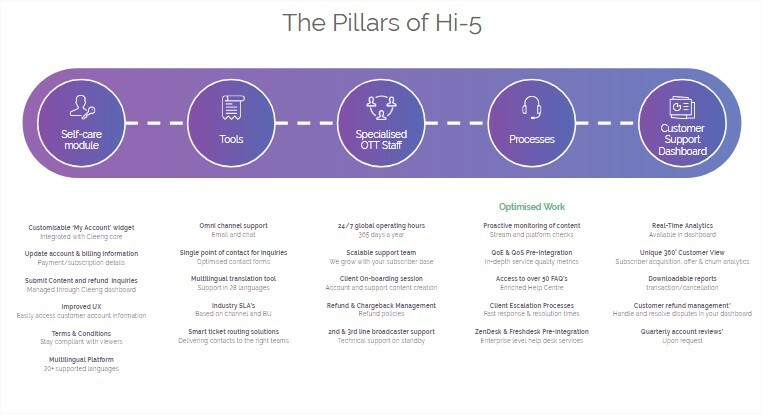 To find out more about Hi-5 and how this innovative new platform can benefit your budding OTT empire, please do get in touch and we’ll be happy to get things off the ground.